It would help us to know when you are likely to arrive. If you could text Kate on 07884 181677 when you reach Exeter, then we will be ready and waiting for you. It should take 30 minutes from there. In the school holidays it can take twice as long to get here as sat nav tells you, so we highly recommend getting up early and leaving before breakfast. You are very welcome to leave your luggage in reception, while you go off and explore for the day. Please text us on 07884 181677 when you get to Exeter, so we know your ETA – it should take c25/30 minutes from Exeter services. From Exeter, heading south on the M5, the M5 splits between A38/A380. Follow the A380 signposted for Torquay for several miles until the road divides at Newton Abbot. (There is a Sainsbury’s signposted “superstore” just off this roundabout if you need supplies). Stay in the outside lane signposted Torquay. Continue on this road until you get to a set of traffic lights and get in the right hand lane signposted Totnes, Brixham and Dartmouth. Continue straight over the next large roundabout and at the second roundabout stay in the outside lane and take the third exit signposted Marldon. After a short distance you will reach a small roundabout, take the 3rd exit signposted Compton and Compton Castle. After approximately one mile you will reach Compton. Travel all the way through the village for half a mile, passing the National Trust’s Compton Castle on your left (see map on P2). Pass some farm buildings on your left and continue around a right hand bend in the lane and we are the 4th driveway on the left signposted Brownscombe Luxury Glamping and Compton Holt – the green sign is slightly tucked up our drive (see photo) and there is an additional small sign 3m beforehand, so have passengers on high alert to find them! It can be difficult to spot in the dark but look out for a 30 mile an hour sign, just before a large white house at the end of our drive. If you end up at a small junction signposted North Whilborough (or followed sat nav via the Bickley Mill) head towards Compton Castle and we are on the right hand side. 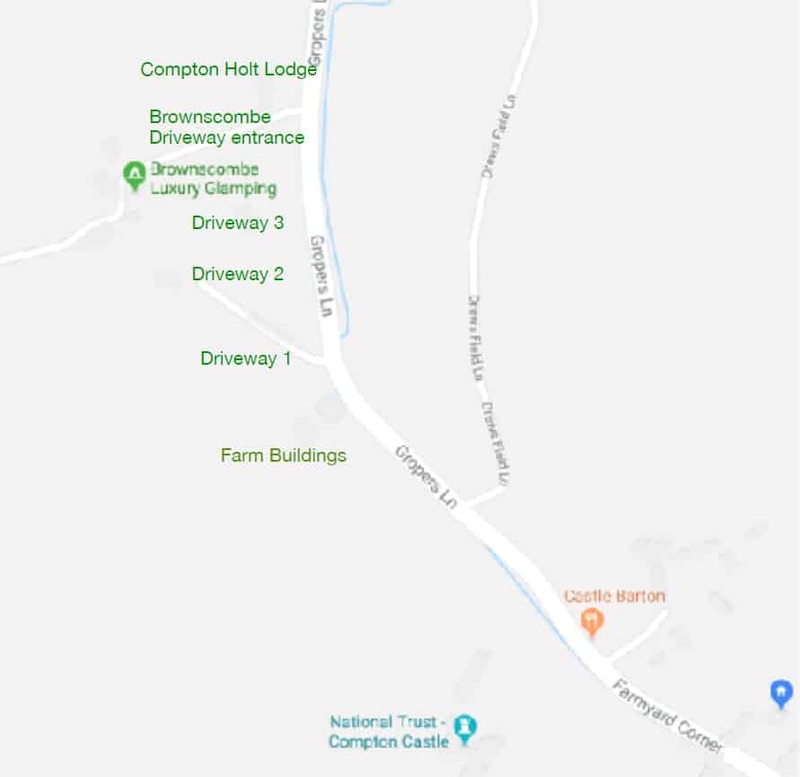 As you come up the drive, bear left in front of Compton Holt and you will see the communal parking area for all guests at Brownscombe Luxury Glamping and Reception, which will be open until 6.30pm on changeover days. Once you have been welcomed and shown into your accommodation, you will be able to drive your car into the field to unpack if it is still daylight. Please contact Kate beforehand if you think it is likely to be later than 7pm and please note that we don’t allow cars into the fields after dark, so an overnight bag of essentials may be required so you can unpack fully in the morning. In colder months, all our accommodation is lovely and warm when the fire is on but we have been advised that we can no longer light fires for late arrivals, as it is a potential fire hazard to leave the fire unattended… so to ensure the warmest possible welcome (in every sense!!) we really encourage you to plan your journey to arrive in good time! Most of our weekends are booked up for 2019 and we have just 2 weekends free for whole site or Safari Tent only bookings; September 27th – 29th and 11th – 14th October. We are taking bookings now for 2020, so if you have a big celebration planned please contact kate@brownscombe.co.uk. If you have a smaller hen party planned for 2019 then you may like to consider a 2 night midweek Wellness break, as we have plenty of availability in the Spring. We love hosting hen parties and welcome them when all four tents are booked. For mixed adult only groups we ask that the whole site is taken to avoid upsetting other guests. We regret that we don’t accept Stag do’s. Brownscombe is located at the edge of a village and we have had fantastic support from our neighbours – whilst they enjoy hearing everyone enjoy themselves during the day, you run the risk of seeing Kate in her PJ’s if you are noisy at night (not a sight that will enhance your weekend!). Our Lodge is soundproof and music can be played and we have had many a hen party disperse at 3am with only the occasional giggle to disturb the owls! If you want karaoke round the camp fire at 1am then this is not the right venue for you! If you want to get away from it all for the weekend, let your hair down in the evenings, catch up with old friends, make new ones as well as having some fantastic memories to take away – call us today to book! A refundable £100 deposit will be charged for group bookings to cover any additional cleaning or damages. To date we haven’t had to keep a penny!